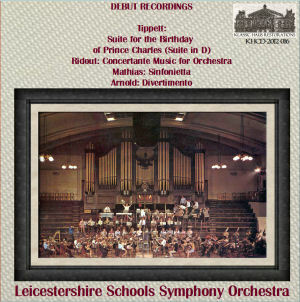 KHCD-2012-016 (STEREO) - Debut Recordings (1967) of British Orchestral Music - Michael Tippett: Suite for the Birthday of Prince Charles (Suite in D), conducted by the composer; Alan Ridout: Concertante Music for Orchestra, conducted by the composer; William Mathias: Sinfonietta, conducted by the composer; Malcolm Arnold: Divertimento, conducted by Eric Pinkett - Leicestershire Schools Symphony Orchestra - A .pdf file containing archival information regarding this recording, compiled by John Whitmore, archivist for the LSSO, is available to download here for those who purchase the CD; the MP3 file includes the .pdf in the download. 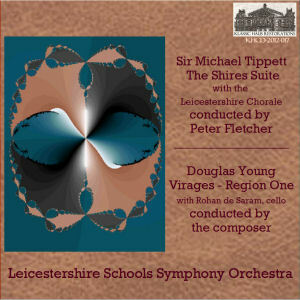 KHCD-2012-017 (STEREO) - Tippett: The Shires Suite - Leicestershire Schools Symphony Orchestra with the Leicestershire Chorale/Peter Fletcher, conductor; Douglas Young: Virages - Region One - with Rohan de Saram, cello - Leicestershire Schools Symphony Orchestra/Douglas Young, conductor - A .pdf file containing archival information regarding this recording, compiled by John Whitmore, archivist for the LSSO, is available to download here for those who purchase the CD; the MP3 file includes the .pdf in the download. 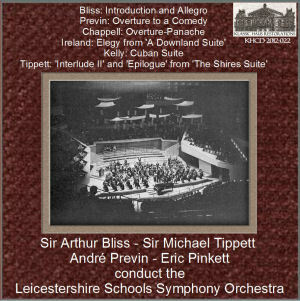 KHCD-2012-022 (STEREO) - Bliss: Introduction and Allegro - conducted by Sir Arthur Bliss; Previn: Overture to a Comedy - conducted by André Previn; Chappell: Overture-Panache - conducted by André Previn; Ireland: Elegy from 'A Downland Suite' - conducted by André Previn; Kelly: Cuban Suite - conducted by Eric Pinkett; Tippett: 'Interlude II' and 'Epilogue' from 'The Shires Suite' - conducted by Sir Michael Tippett - Leicestershire Schools Symphony Orchestra - A .pdf file containing archival information regarding this recording, compiled by John Whitmore, archivist for the LSSO, is available to download here for those who purchase the CD; the MP3 file includes the .pdf in the download. 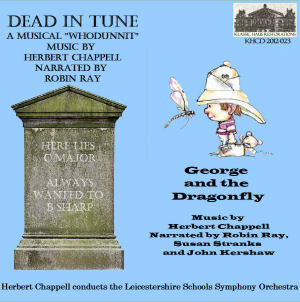 KHCD-2012-023 (STEREO) - Chappell: Dead In Tune - a musical "whodunnit" - written and narrated by Robin Ray; George and the Dragonfly - written by John Kershaw; narrated by Robin Ray, Susan Stranks and John Kershaw - Leicestershire Schools Symphony Orchestra/Herbert Chappell - A .pdf file containg archival information regarding this recording, compiles by John Whitmore, archivist for the LSSO, is available as a download here for those who purchase the CD; the MP3 file includes the .pdf in the download. 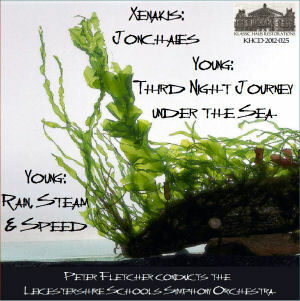 KHCD-2012-025 (STEREO) - Iannis Xenakis: Jonchaies; Douglas Young: Third Night Journey under the Sea; Rain, Steam & Speed - Leicestershire Schools Symphony Orchestra/Peter Fletcher - A .pdf file containing archival information regarding this recording, compiled by John Whitmore, archivist for the LSSO, is available as a download here for those who purchase the CD; the MP3 file includes the .pdf in the download. 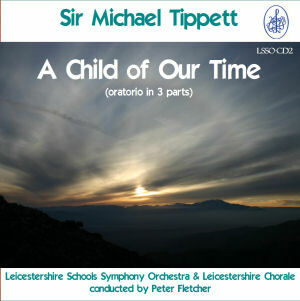 A .pdf file containing archival information regarding this recording, compiled by John Whitmore, archivist for the LSSO, is available here. The .pdf file is included in the download file for those who purchase the MP3 version. 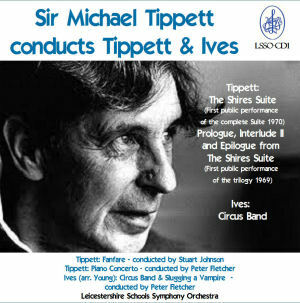 LSSO-CD2 (MONO) - Sir Michael Tippett: A Child of Our Time - Soloists/Leicestershire Chorale/Leicestershire Schools Symphony Orchestra/Peter Fletcher A .pdf file containing archival information regarding this recording, compiled by Joh Whitmore, archivist for te LSSO, is available here. The .pdf file is included in the downolad file for those who purchase the MP3 version.